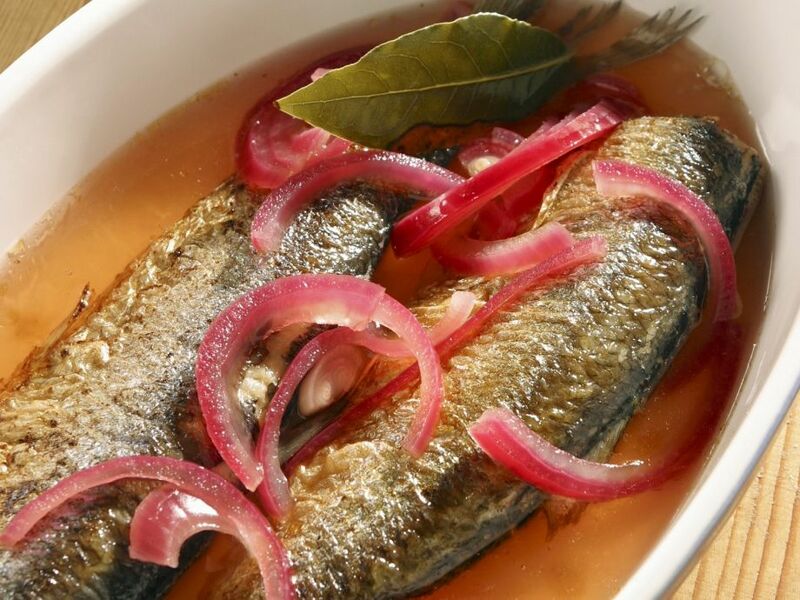 1 Remove the fins from the herring, sprinkle the inside and outside with lemon juice and let stand for about 30 minutes. Season with salt and pepper and coat with flour. 2 Heat the butter in a frying pan and sauté until golden brown on both sides, around 3-4 minutes per side. Remove from the pan, transfer to a baking dish and let cool. Peel the onions and cut into rings. For the marinade: Simmer 400 ml (approximately 1 2/3 cups) water, vinegar, rosé, onions, sugar, bay leaves and peppercorns for 2-3 minutes, remove from the heat and let cool. Pour over the fish and let marinate for 24 hours before serving.